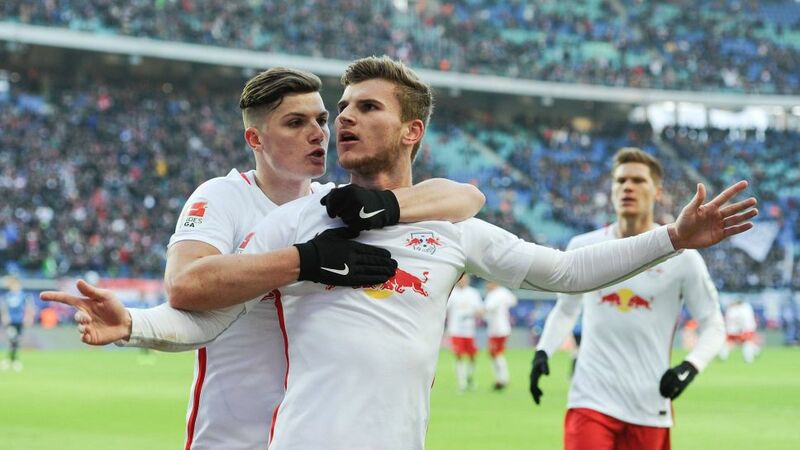 Timo Werner (c.) was outstanding in Leipzig's win against Hoffenheim. Under the watching eyes of Germany coach Joachim Löw, RB Leipzig forward Timo Werner delivered his case for a maiden international call-up in emphatic style by inspiring the Easterners to a 2-1 triumph against TSG 1899 Hoffenheim on Matchday 18. Werner earned 14 Official Fantasy Bundesliga points on Matchday 18 - sign him up by clicking here now! After RB had gone a goal down on home turf for the first time ever in the Bundesliga, Werner led the response, scoring shortly before half-time in his customary, poacher fashion to level proceedings. The 20-year-old was influential in the second half as his side mounted wave after wave of attack, before Marcel Sabitzer's late strike secured all three points for Ralph Hasenhüttl's side. Vote Werner for #BLMVP on our Twitter channel now! Werner's six shots were twice as many as anyone else on the field at the Red Bull Arena.The former VfB Stuttgart forward is now the top-scoring German in this season's Bundesliga, with 11 goals to his name. Werner's 32 sprints were more than anyone else on the field. Head to the Leipzig vs Hoffenheim match centre for more on this fixture.